What are the best archery releases for 2009? What are the Best Bowhunting Releases for 2009? There are so many great releases and to list just a few is difficult, but below are three of the best for the year, listed in price order. 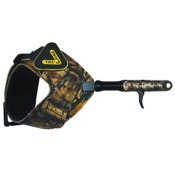 Designed with a smaller than dime sized head, pull trigger jaws open–release trigger jaws close, fits both Rh/Lh, camo leather FOLD BACK buckle strap, adjustable trigger travel. Black Anodized aluminum head with camouflage strap, New 3 Position Draw Length Adjustment, New Silent 360 Degree Globo Swivel on a fold away strap connection. For under $25.00, this release can’t be beat: Dual caliper center release jaws, E-Z adjustable nylon extension for a custom fit, padded nylon loop lock strap, black anodized release head, and gun- style curved trigger.